I waste a lot of key strokes on this blog complaining about things like health care reform, Medicaid expansion, Medicare payment reform and changes to the care delivery model. The truth is, if it weren’t for the sacrifices of veterans and their families I would not have the liberty to complain about those things. Our right to complain and voice our opinion is what makes our country the greatest on earth. I get tired of the partisan politics in DC and I am frustrated that common sense so often loses out to politics but politics are what our country was founded upon. We live in a democracy and we’re free but freedom comes at a price. There’s no way to measure the price of freedom because in far too many instances freedom has been preserved at the cost of a life. The men and women who have donned one of our nation’s uniforms, both in peace time and in war, are heroes and we owe them a debt of gratitude that we can never fully repay. It’s easy to take for granted the freedom we enjoy and it’s easy to forget the meaning of Veterans’ Day. November 11, 2013 was Veterans’ Day and it was a day that meant a whole lot more than no mail or banking opportunities. It was a day that we were reminded that every time our nation has come under attack someone rose to our defense. It was a day that we were reminded about the courage and sacrifice that has, and continues to keep us safe. It was a day that we could acknowledge our debt and gratitude for those who serve in the armed forces. More importantly November 11, 2013 was a day like any other. That’s because we shouldn’t need a day to remind us to thank those who protect us. The self-sacrifice, devotion and courage of America’s veterans should be acknowledged every day. I’d encourage you to pay proper tribute to our veterans by acknowledging them every chance you get. When you see an active member of the military in the airport or on the street, shake his or her hand and thank them for their service. When you encounter a veteran at a restaurant, grocery store or church say “Thank you for your service”. The next time you speak to the family of a service member thank them for their sacrifice. Freedom is not free and a date on the calendar shouldn’t trigger our gratitude. Most of the people reading this blog are health care workers and I’m going to guess most of them receive a thank you or hug from a grateful patient each and every day. Our veterans have done as much to protect our wellbeing as health care workers and we should make a point to thank them every chance we get. 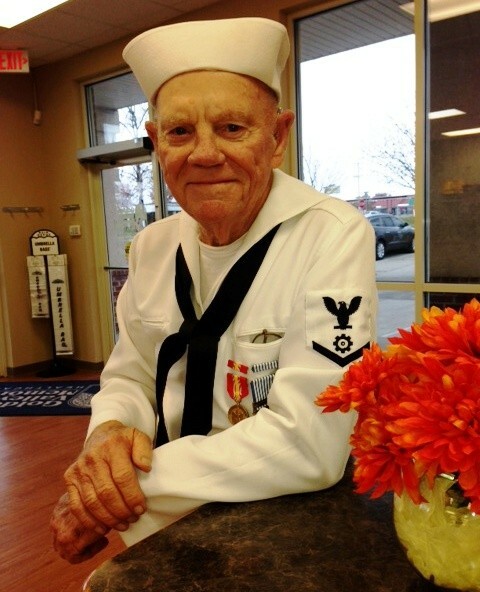 Staff at our outpatient therapy center on Ohio Street shared a story about a visitor they had on Monday, November 11, 2013, Veterans’ Day. 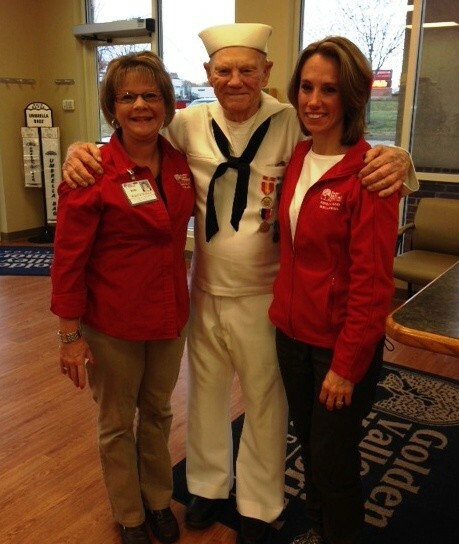 A true hero paid them a visit and asked to take a picture with a couple of the staff. His visit was touching and provided the staff the opportunity to say “Thank you”. Many of you will recognize the hero in this picture, Mr. James Plumlee. He’s pictured with Kelly Jones and Joie McQuitty. Thank you for your service Mr. Plumlee, we are forever in your debt.